It’s time to start thinking about warm, comfort-style meals like this Italian beef and vegetable soup. 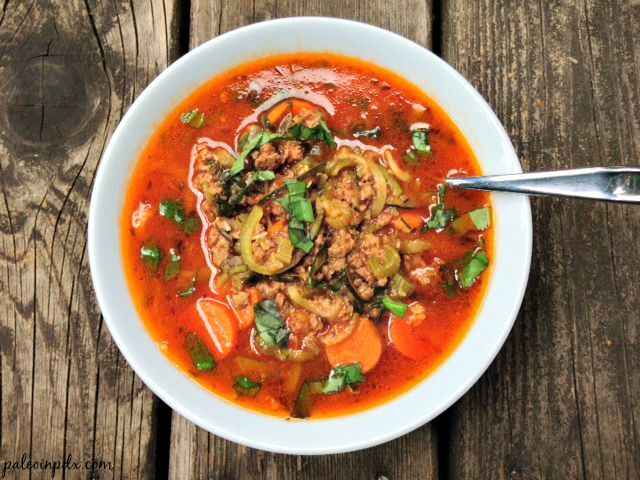 This flavorful soup makes for a perfect dinner on a chilly fall or winter day! Meanwhile, I have a busy and fun fall lined up! In October, Jesse and I are headed down to LA to complete a week-long training with Jill Miller of Yoga Tune Up. We both have a lot of respect for Jill’s work and are grateful for the opportunity to train with her. In November, I’m headed to NYC with a very dear friend of mine. We’re going to a conference called, “I Can Do It!” and are spending some extra time there for fun (it’ll be my first visit to NYC!). In December, Jesse and I are headed to Honolulu for a week of pure vacation. Melt butter or ghee in a large soup pot over medium heat. Add the onion, garlic, celery and carrots. Sauté a few minutes, stirring occasionally. Then, add the ground beef and pork sausage, breaking up the meat with a spatula. Add the sea salt, black pepper, oregano, thyme and cayenne to the mixture, and stir. Once the meat is browned, add the broth, tomato sauce, tomato paste and bay leaf. Stir well and then add the zucchini noodles and fresh basil. Simmer for about 25 minutes. Taste soup after simmering and adjust seasoning as necessary. Remove bay leaf when ready to serve. Garnish with extra chopped basil and/or raw Parmesan cheese for serving, if desired. Previous Post: « Cinnamon Spice "Porridge"